Six of Trinity's archers finished in the top 10 in their categories in DCU at the weekend. 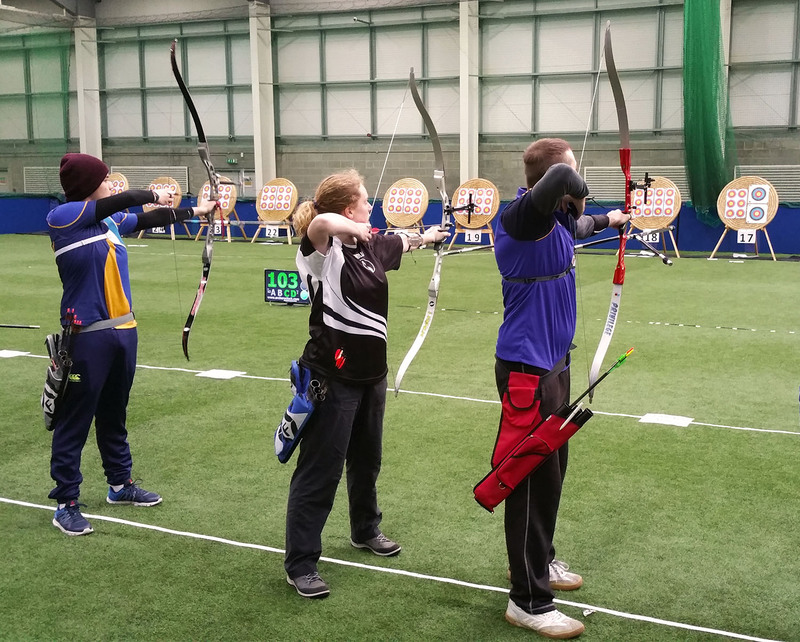 Dublin University Archery Club (DUAC) travelled to Dublin City University on Saturday for their second intervarsity competition of the year. DUAC had 13 archers present, competing across five categories including bare bow female and compound male. Six of DUAC’s archers placed within the top 10 in their categories. In her first year of shooting, Aoife Simm won the female beginner recurve. Eve Kearney came third in the same category. Captain Diego Coyle Diez shot a score of 503 out of 600, the club’s highest recurve score in the competition. Meanwhile, Pádraig Dunphy shot the highest score overall for Trinity. DUAC are now fifth in mixed and compound teams and sixth in recurve in the college circuit. This placement comes after five archers placed in the top 10 at intervarsities in Carlow (Carlow IV) earlier in the season. The club have now won five medals this term, an increase on last year’s tally. There are three intervarsity tournaments remaining. In an email statement to The University Times, DUAC public relations officer Richard Murray reported that Coyle Diez believes DUAC’s improvement in the DCU tournament came as a result of the replacement of a bow broken during the Carlow IV. The email said that “the improvement seen between the two competitions is likely due to the full potential of club members not being obscured by equipment limitations. This routine attrition of equipment had been one of the limiting factors for the growth of the club and had limited serious competition to those who owned their own equipment”. “In justifying the rapid progress that the club has been able to make in the short time he has been at the helm”, said Murray, “Diego has cited the great impact that having access to college facilities has made on the availability and affordability of participating, in addition to the availability of funding for professional coaching for the entire club”. Coyle Diez has been one of the driving forces behind a movement to implement a one club, one vote system for elections to the Executive Committee of Dublin University Central Athletic Club (DUCAC). Speaking to The University Times in October, Coyle Diez said that “right now, it just seems it’s all preordained who wants to be in there, so certain clubs or certain people” can exercise control over DUCAC. Coyle Diez told The University Times that he had been approached by “three staff members who supported this”. An earlier version of this article incorrectly stated that Diego Coyle Diez shot the highest score for DUAC. In fact, Pádraig Dunphy shot the club’s highest overall score. Coyle Diez shot the club’s highest recurve score.